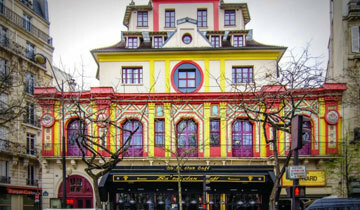 On November 12, Sting will perform an exclusive concert in Paris for the re-opening of the Bataclan. The artist will be joined by a 3-piece band including Dominic Miller (guitar), Vinnie Colauita (drums) and Rufus Miller (guitar) performing songs from his new album 57th & 9th . Sting says, "In re-opening the Bataclan, we have two important tasks to reconcile. First, to remember and honour those who lost their lives in the attack a year ago, and second to celebrate the life and the music that this historic theatre represents. In doing so we hope to respect the memory as well as the life affirming spirit of those who fell. We shall not forget them." J'étais au Bataclan le 13/11/2015 pour voir EODM, j'ai été blessée par plusieurs balles. Je serai ce soir 12/11/2016 au Bataclan pour le concert de Sting. Très important pour moi & pour ma reconstruction. Police est le 1er concert que j'ai vu le 11 janvier 1982 au Bourget, France. Quel symbole pour moi. Merci de venir jouer pour nous. It can't be a better idea. Sting is the perfect man to honor the reopening of the Bataclan. I hope I will be able to find tickets to attend the concert with my two children. We must celebrate life and sing together in memory of the victims. Great idea. Hope I could buy tickets. "Carpe diem" à Paris ! what a great man and artist !!! for my husband and I. He's so fan, it's our neighbour and our anniversary, we can't miss that rendez-vous. Le bon mec à la bonne place! Merci, Sting de venir chanter et partager les émotions essentielles au Bataclan. Je crois malheureusement que je n'aurai pas le courage de venir t'écouter tant ma sensibilité est meurtrie. Bon concert à tous, morts et vivants, sweet vibrations . * ° . * ~~^~~ * °. Hopefully we'll be able to get our tickets, my girlfriend likes to go to see Sting, and so do I :-) It's a good thing to donate for "lifeforparis" and honour the victims! Sting is great, Sting is good, Sting is magic Kind regards from Belgium.